We are up at the Biggest Week in American Birding this year! So far it has been a magical experience for these two migration junkies 🙂 It is a total change of pace for us, both in the way we look at migration and the shear number of birds. When predicting bird movements via radar and weather forecast model data over Florida, we pay close attention to migration over the Gulf of Mexico and the Florida Straits. Here in Ohio we have to look at migration a bit differently. Birds are first moving over land and then heading out over the water, the total opposite of what is happening in Florida. Thus, velocity radar data becomes instrumental in our interpretations of images for this region. This data gives us information about what direction birds are traveling and at what speeds. An important thing to know when attempting to interpret and predict bird movements. Below you will find a few images with some interpretation about what the data is telling us. Notice how velocity is increasing over Lake Erie. Birds are lifting off and picking up elevation before reaching the lakeshore. Once over the lake, they have already climbed to an optimal cruising altitude, and as a result are moving faster and more efficiently. 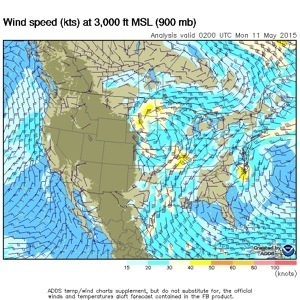 This helps migrants cross this large body of water, especially with a tailwind. Current weather map shows us that a front is headed east while a stalled front is lingering. The stalled front should begin a shift to the east as the cold front moves in over the following days. Birds should be on the wing until the wet part of this front moves over the Great Lakes region. Look at those wicked awesome winds! Birds have a tailwind to carry them north and northeast from the Gulf of Mexico all the way north to the Great Lakes and Northeast region. 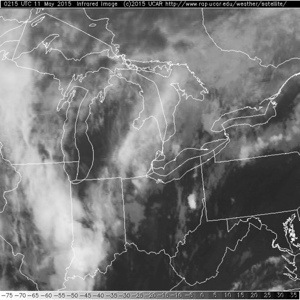 Satellite imagery records lots of cloud cover just west of Ohio. This cloud cover will continue to move east as the cold front moves into the area. 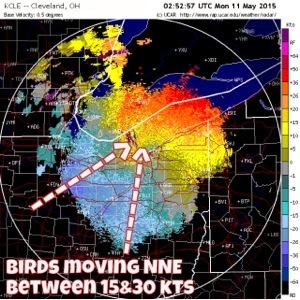 Birds can’t fly into thick cloud cover and fog, well they can, but are smart enough to drop down before being caught out over Lake Erie with less than optimal winds and weather conditions. Over the coming days we should expect new arrivals at Magee Marsh and other hotspots in the area. Birds are on the move ahead of the front and will eventually meet up with a wind shift and precipitation courtesy of the front. 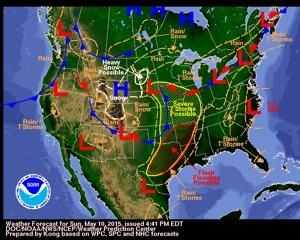 We will try to post again tomorrow so that we can continue to monitor the weather as well as what migrants are doing. Stay dry folks!